I have had some trees cut down recently and the wood ground up. I was told that the wood was good for mulch around other plants, shrubs and trees. Is this true or will it attract carpenter ants and termites? 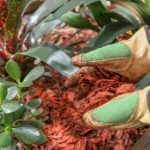 Your mulch should be aged before using for several reasons and yes, bugs are one of them. Fresh wood mulch also leaches a lot of nitrogen from the soil because nitrogen is necessary to the decay process.